This is the second in my series of Big Fashionista Favourites, I was going to do this as a general review post but I loved the concept so much that it instantly became one of my BFF's. 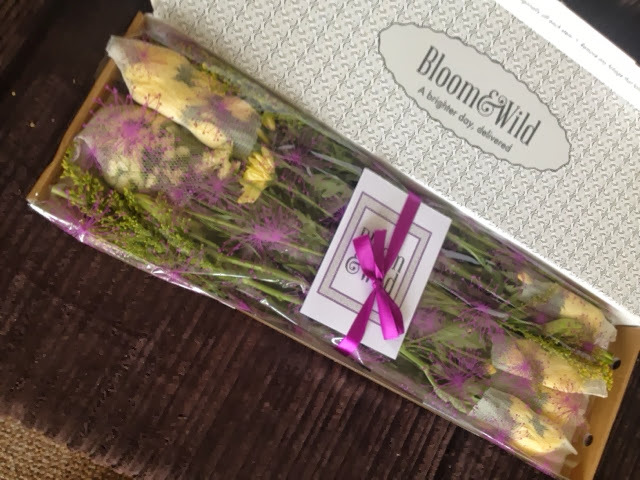 Bloom & Wild are a flower subscription service that means you can receive bouquets of flowers through the post on a regular basis. You can choose from weekly, fortnightly or monthly deliveries of beautiful fresh flowers that can be arranged into a bouquet in just minutes. The box can fit through a standard letterbox as well, meaning that you don't have to wait in for your delivery and the fresh flowers are picked especially for you, meaning that they aren't hanging around losing their bloom. The flowers are not picked or cut until they are needed, meaning you can be assured of their freshness and longevity. 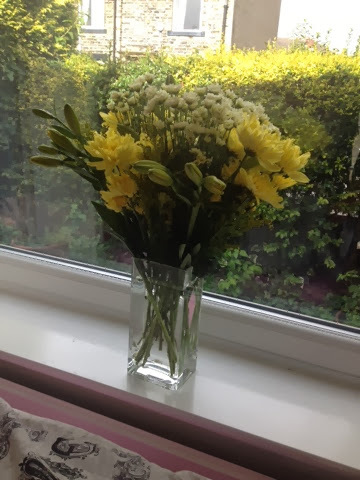 I was asked if I would like to review a box for myself and once the poor guys had had their fingers sewn back on, after I had bit them off in my eagerness to receive flowers, they sent me a box of beautiful flowers so that I could see for myself what a great idea it is. Look at my flowers, my flowers are amazing! 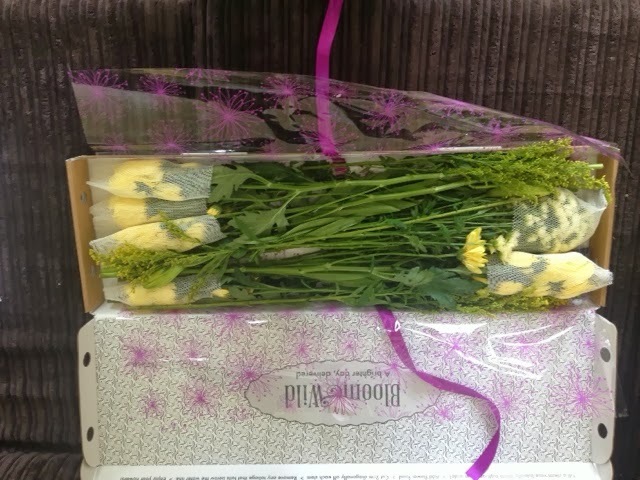 This is how the flowers arrive, as you can see, the box will easily fit through the letterbox. Inside the box, the flowers are packed carefully so that they are not damaged in transit and arrive to you in beautiful condition, all you have to do is arrange them, and they even come with a step-by-step guide to arranging them. I felt like a professional florist unpacking the flowers and I was impressed at just how many flowers were in the box. My beautiful flowers once arranged. I was extremely impressed with the flowers and I think I will be treating myself to a subscription, there is nothing nicer than beautiful fresh flowers and I also think that this would make an excellent gift idea for people, even someone who you don't get to see regularly but would love to show that you are thinking of them. Their subscriptions begin from £13.95 per bouquet and you can also order a one-off box. A great way to try out the service. 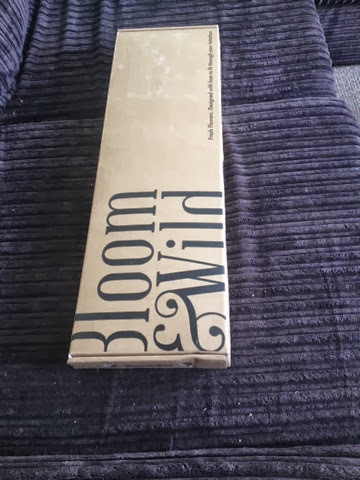 I thought that I was bored of subscription services but Bloom & Wild have shown that there is definitely still a market in this kind of service and I think that it is a clever idea backed up with an excellent product, which definitely makes them a BFF of mine. Go check out Bloom & Wild at http://www.bloomandwild.com and let me know what you think. Would you order this kind of delivery for yourself? I know that I definitely would. Thanks for the fantastic review! And great photo of the flowers against the garden backdrop... Keep them out of the sun and they'll last even longer!